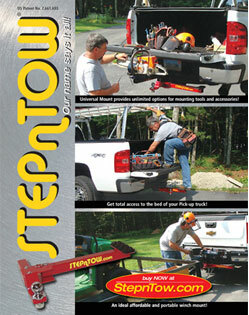 STEP-n-TOW® a step up for man a leap up in safety and convenience! The most versatile hitch mounted step, ball mount and winch mount that money can buy! It's a whole NEW system! 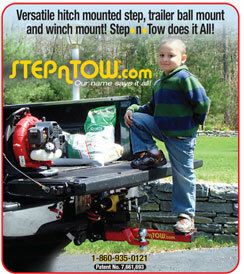 The new STEP-n-TOW swing out step is a versatile tool for pick-up trucks and SUV’s. It allows easy access to the pick-up bed or roof racks. STEP-n-TOW always offers convenience and safety for everyone in the family or work place. From the durable galvanized, powder coated finish to the 18", 90° swing out safe non-skid rubber foot- step, this product boasts quality through and through. Fits any standard 2" receiver, ideal for the home owner, farm, DIY, contractors, trailers (utility, travel, camping and boating), anyone and everyone needing access to the back of a pick-up truck or the roof rack of any sport utility vehicles. STEP-n-TOW also becomes a versatile winch mounting platform with the addition of the winch mounting block (p/n 72251). This system will satisfy any standard two bolt mounting pattern with winches up to 3000 lb capacity. 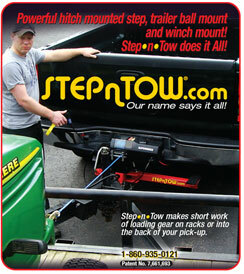 Simply place the STEP-n-TOW in the 2” receiver and your ready to pull in more ways than one.